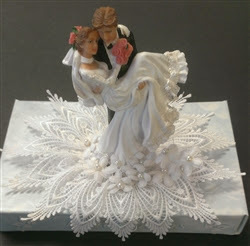 If you already have an overall wedding theme to consider, choosing a wedding cake topper becomes much easier. You simply need to accent your cake with a symbol or motif from that theme. For example: snowflakes for a winter theme, birds for a fall theme, anchors or seashells for a nautical theme, etc. When you choose a topper based on personality, you want it to be a direct representation of your union. This is definitely a more personal and artistic choice that has the potential to radiate a specific vibe or emotion throughout your wedding. Through custom-made figurines, monograms, flowers or lacy wedding toppers, you can depict the style of your relationship, whether it be romantic, trendy, quirky, funny or dramatic. It is crucial to coordinate your cake design and cake topper decisions together. Keep your pastry chef in the loop about any decision relating to your wedding cake. He or she can help you decide if the cake topper you have your heart set on will integrate well with the design of the cake or perhaps even fit on it at all. The perfect way to keep your cake designer updated is to show him pictures of the cake topper you want to buy. Figuring out the logistics beforehand and having the dimensions readily available is advised as well. If you have a specific theme in mind and don’t see what you’re looking for on our site, please don’t hesitate to contact us with your desired look. We would be happy to locate more options for you to choose from. As lovers of everything wedding and baked-goods related, we’d love to hear your own experience choosing the perfect cake topper for your special day. Let us know in the comments below!